Coffee Time Romance is a long-established review site. They contacted me some time ago to say they were establishing a whole new section for the steampunk genre, and would I like to be one of their featured authors to help them launch the site? Needless to say, I told them I would love to be included. As an aside, and from a purely business standpoint, this is another indicator to me that the line between traditionally published and indie published novels is becoming very blurred indeed as far as readers are concerned. No mention was made of what flavor of publishing my books possessed—all that mattered was that they were a good representative of the genre. Imagine that! So if you have a moment, pop over to the new steampunk section and read my interview. They’re doing giveaways, and one of the prizes is a paperback set of the Magnificent Devices books! In Bodie, the wildest gold-mining town in all the Wild West, Daisy and Freddie Linden hope to find their father at last. But deadly secrets lie in their way ... and so does murder. 32140 / 70000 words. 45% complete. Jago Tremayne and Rowena Penrose. Chalk and cheese. Oil and water. But attraction goes beyond such differences and straight to the heart. 0 / 70000 words. 0% complete. Sign up for Shelley‘s mailing list & begin the adventure with “The Abduction of Lord Will.” Join the flock! Shelley Adina is the author of 24 novels published by Harlequin, Warner, and Hachette, and a dozen more published by Moonshell Books, Inc., her own independent press. 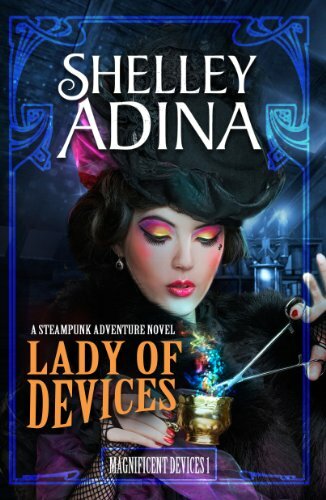 She writes steampunk, contemporary romance, and young adult fiction, and as Adina Senft, writes women’s fiction set among the Amish and other plain communities. She holds an MFA in Writing Popular Fiction from Seton Hill University, and is earning a PhD in Creative Writing from Lancaster University in the UK. She won the Romance Writers of America RITA Award® for Best Inspirational Novel in 2005, was a finalist in 2006, and in 2009 was a Christy Award finalist. When she’s not writing, Shelley is usually quilting, sewing historical costumes, or hanging out in the garden with her flock of rescued chickens.